Maybelline seems to have taken over lately... I promise this will be that last one (for a few days, maybe...) It's not that everything is brand spanking new, but there seems to have been some delay in terms of certain launches making their way to Canada. 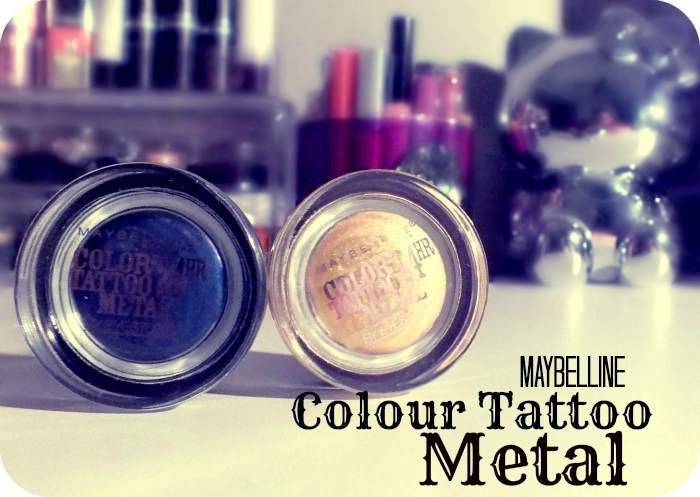 I was super excited when UK bloggers started showcasing the new Metal collection of Maybelline's ever popular Colour Tattoo cream shadows, but they seemed to take an awful long time to get here. Thankfully, the wait is over! 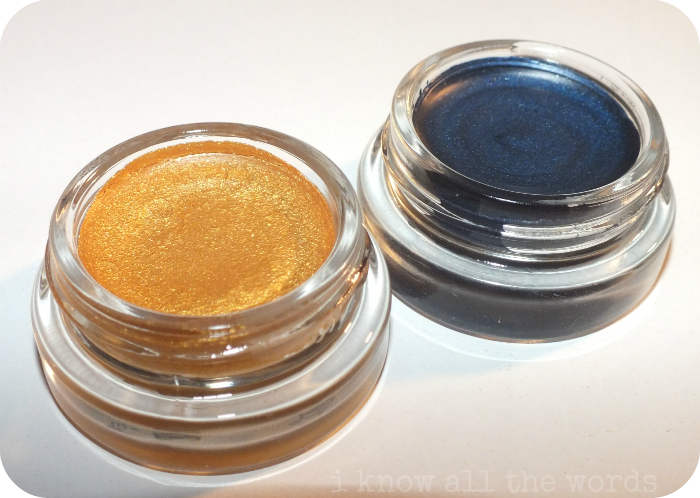 I have two out of the five shades to show you today- Gold Rush and Electric Blue. To see my previous Colour Tattoo posts check them out here and here. 'Continuing to champion the area of eye artistry, Color Tattoo delivers bold, vivid, metallic colours and the longest-lasting cream-gel shadow on the market. In just two simple steps, eyes get an exquisite and daring pop of metallic colour. Now you too can get the on-trend metallic look with the same great Color Tattoo line! If you've yet to try these- seriously though, who hasn't tried these by now? Are similar to MAC Paint Pots and Benefit Creaseless Cream Shadows in the fact that they're cream shadows that set. 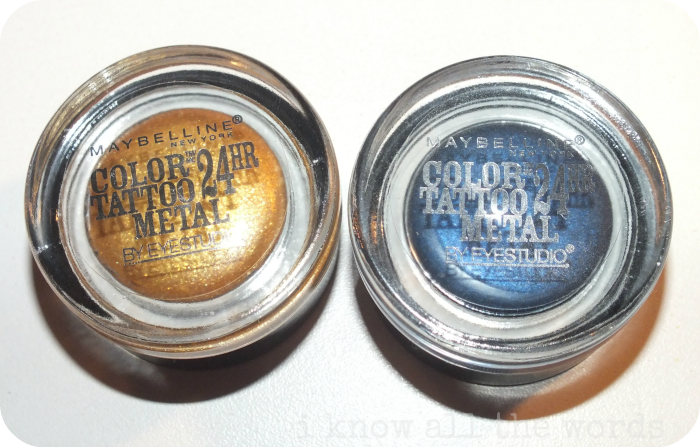 Formula wise, I've noticed that the new shades- those in the Metal collection don't seem to be as opaque as the original line up, but I've only used two of the shades. I'll get into specifics in the shade breakdown. While these may not be quite as opaque, they do wear just as well as the originals. I usually use a primer under them anyway, be even without it, these wear all day without creasing and only minimal fading and that is really only the deeper shades. 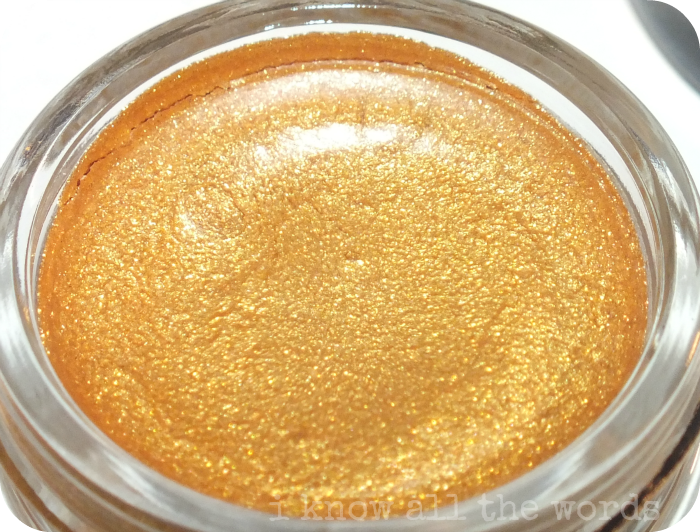 Gold Rush is a shimmering gold with a bit of gold micro glitter. This shade is the worst offender in terms of sheerness and patchiness, but, it can be built up, and you can eventually get an even coverage with a bit of finagling. I just gave this a second or two to set between layers and I was able to get a decent opaqueness. 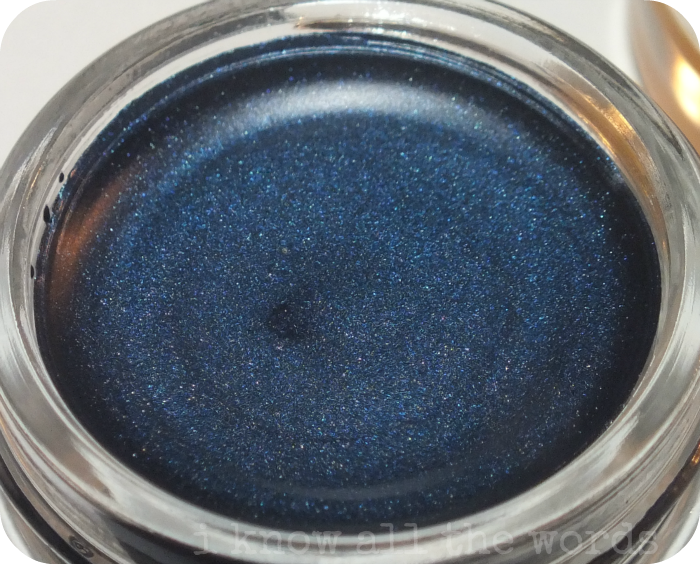 Electric Blue is a deep, blackened cobalt with multi-toned micro shimmer. The name 'electric' doesn't exactly apply, but the shade is gorgeous, so we'll just ignore that. 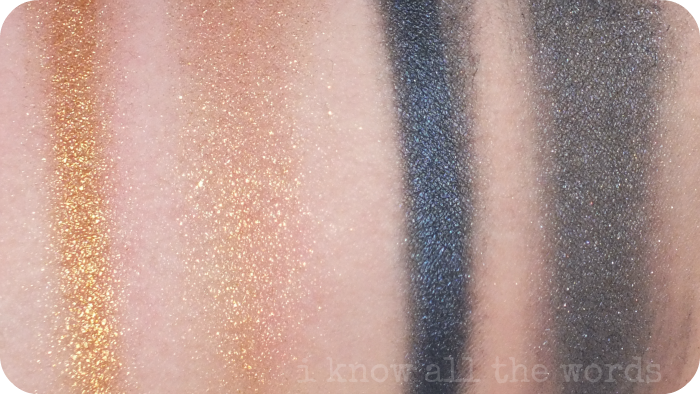 When blended out, this isn't super opaque either, but does have more pigmentation than Gold Rush and applies evenly and is easy to build up. 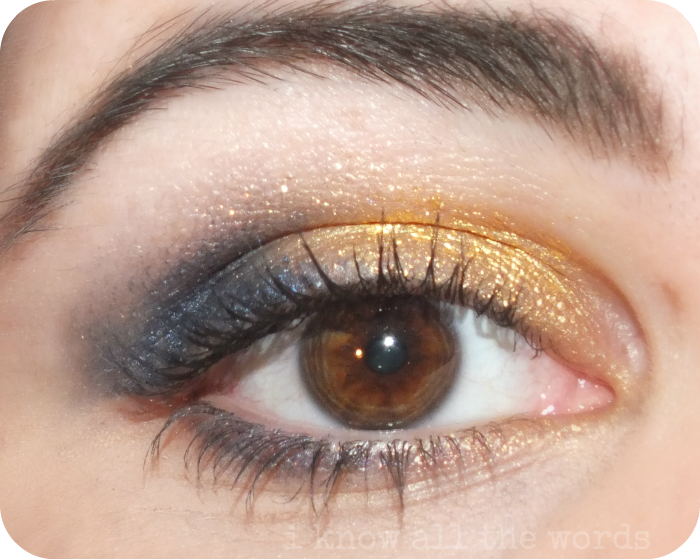 I was initially just going to go with a wash of Gold Rush over my lids, but I couldn't help but add a bit of Electric Blue to the outer corner. 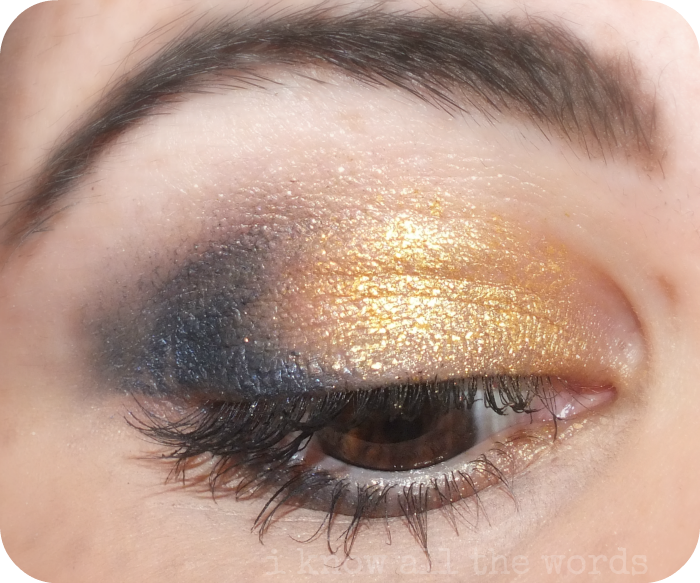 These shadows are quite easy to blend together, and make for a super quick and easy look. 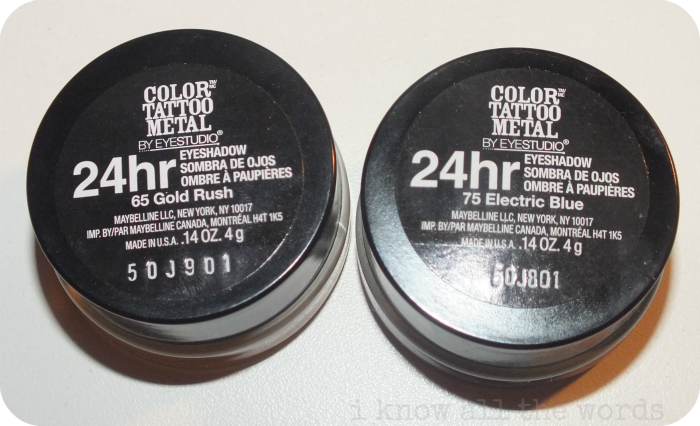 Overall, these are great if you've been hankering for new Colour Tattoo shades, but they aren't really as 'metal'-like as I expected. Have you tried any of the new shades? What did you think of them?